Olomouc has the second oldest and largest urban preservation area in the Czech Republic, with about 230 cultural sights. 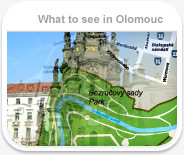 We are happy to present here various tours around/within Olomouc region. You can experience the great combination of culture, historic sights, nature, a wide range of sporting opportunities, as well as gastronomic traditions.